How Far is Sai Vaibhav? 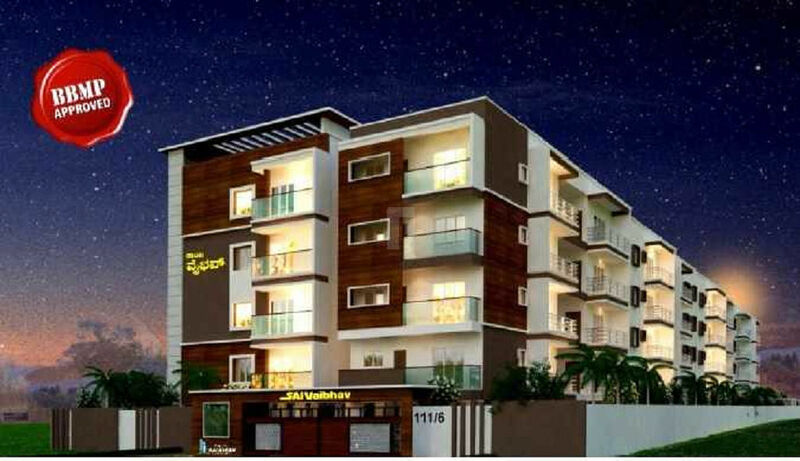 Sai Vaibhav is an ultimate reflection of the urban chic lifestyle located in Kengeri, Bangalore. The project hosts in its lap exclusively designed Residential Apartments, each being an epitome of elegance and simplicity. Located at Kengeri in Bangalore, Sai Vaibhav is inspiring in design, stirring in luxury and enveloped by verdant surroundings. Sai Vaibhav is in troupe with many famous schools, hospitals, shopping destinations, tech parks and every civic amenity required, so that you spend less time on the road and more at home. Vitrified tiles for living, bedrooms and dinning. Anti-skid ceramic / Daddoing tiles in kitchen, utility and bathrooms. Internal cement mortar with lime rendering. External with sponge Finish. Asian paints : Interior Emulsion paint. External ACE, Enamel Paint for MS grill/door. Electrical Wires - Provision for 1 AC point at master bedroom, concealed wiring with switch panels. TV & Telecom point in living and Master bedroom. Main Door : Teak wood frame with BST Doors & All other doors of sal wood frame with Flush doors. Aluminium powder coated sliding windows with grills and plain glass wherever necessary. Steel sink on granite platform with 3 feet height daddo above platform. 24 hours water supply from bore well with overhead tank & sump with Cauvery water provision. Granite flooring for lobby and staircase for all floors with MS Railings. ESS - ESS hot and cold water mixer in the all toilets. Glazed / Ceramic Tiles in toilets upto 7 feet height. Wall mounted standard make fittings, EWC and wash basin in all toilets.